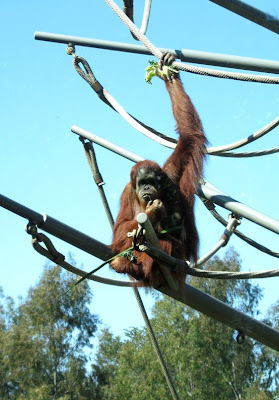 This is my continuation post about the San Diego Zoo which you are welcome to skip or just peruse the photos or call again another day. Some discussion about the Zoo was featured in this post and hopefully I won’t repeat myself too much. 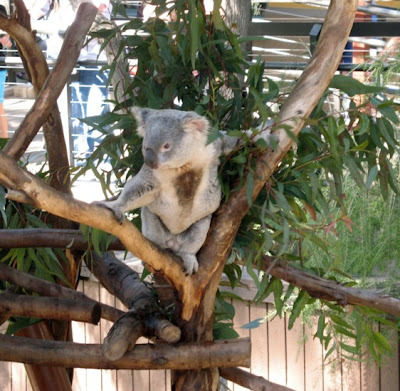 The koala exhibit is extensive, with the largest exhibit outside of Australia. As they are nocturnal, sleeping 18 hours a day, it is unusual to see one so active. Koala means “no drink” as they receive hydration from the eucalyptus leaves. The $34 entry fee to the zoo entitles you to ride as often as you wish on their guided open double-decked bus tours as well as the gondola lift which crosses the zoo. So the bus tour was the first thing we did in order to get an overview of the zoo. It seemed we arrived at a very busy time for we had to wait in line for a while. Since the bus has access to about 75 percent of the zoo we enjoyed a very good orientation to what there was to see with lots of information delivered by the guide/driver of the bus. Su Lin, a female Giant Panda, was born in the Zoo in August 2005, the third of four cubs born in their Giant Panda Research Station. The Zoo covers 100 acres and is home to over 4000 animals of more than 800 species. It is a non profit organization which is heavily into conservation and species-preservation efforts maintaining a very active research division, the Center for Conservation and Research for Endangered Species (CRES) . The habitats of the animals are very natural and the grounds are maintained as an arboretum. Another interesting venture is the growth of some rare animal foods. 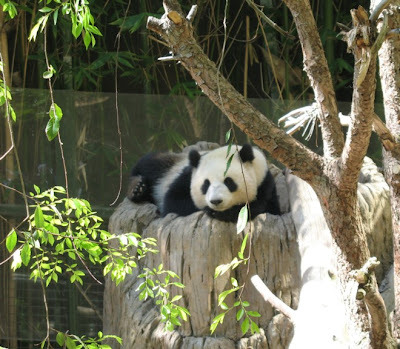 For example, the Zoo raises 40 varieties of bamboo for the pandas which are on long-term loan from China, and it maintains 18 varieties of eucalyptus trees to feed its koalas. In addition it sells some of this harvest to other zoos. There are half a dozen or so gorillas in the wonderful habitat with its natural landscape of cascading waterfalls, open meadow, and climbing areas. The big silverback male was behind glass and the photo not suitable for use. 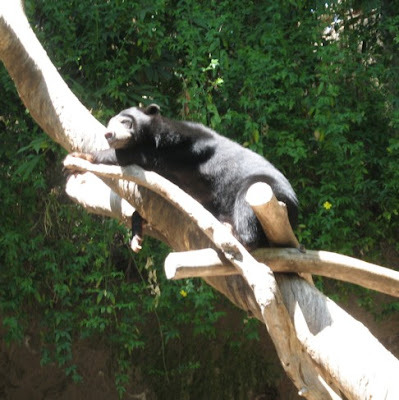 One of the interesting exhibits at the zoo is the Sun Bear Forest, home to the smallest of all the bear species and an endangered species in their native area in the tropical rain forest regions of Asia. They are only half the size of the American black bear. stretched out in the sun on the branches in its habitat. Domestic Bactrian Camels have existed for thousands of years in Asia where they are used to pull wagons loaded with supplies. 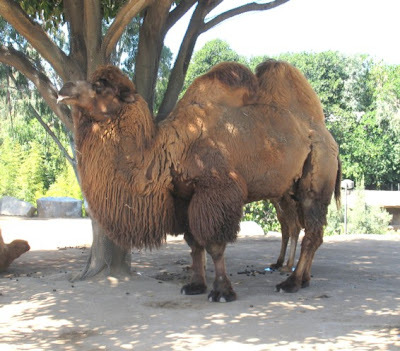 Bactrians have two humps where they store fat for use as nourishment when food and water is scarce. This was one of three Domestic Bactrians at the zoo. Look at the huge feet which prevent the animal sinking into the sand or snow. 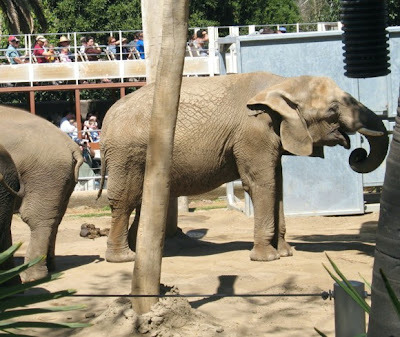 The San Diego Zoo has three elephants, two Asian which are smaller and have smaller ears than the one larger African elephant with large ears which you see below. They constantly flap their ears to keep cool. An elephant’s trunk is both an upper lip and a nose. The trunk has more than 40,000 muscles in it which is more than a person has in his or her whole body. An elephant’s trunk is so strong and agile, it can push down trees, or pick up a single piece of straw. The double-decked open bus can be seen behind this African elephant. Orangutans spend most of their lives in trees and travel by swinging from branch to branch with their long arms. Yes their arms are longer than their bodies, stretching seven feet from fingertip to fingertip. They tend to be more solitary than the other great apes. Being loners they therefore spend a longer childhood period with their mothers since they have to learn everything they need to know to survive on their own. One of the first things you see on entering the Zoo is the lovely pond habitat for this very gorgeous flock of Caribbean flamingos. Being very social animals they were busy interacting which of course also includes pushing and shoving and pecking at each other. Flocks over a million are known in the wild. At the Zoo the flamingos are fed special pellets which contain all the nutrients they need plus whatever is needed to keep their beautiful colour. The colour is quite varied in this flock and they share the habitat with a variety of ducks and scarlet ibis. plus the very different colour amongst the flock. 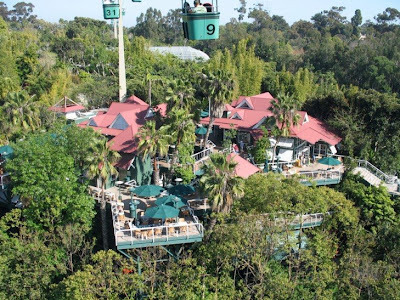 The Skyfari aerial tram provides an airborne shortcut over the treetops from near the entrance to the other end of the Zoo and shows spectacular views of the Zoo, its animals and plant collections, and nearby Balboa Park where the Zoo is situated. It was a popular ride as we had to wait there too. I think this post is long enough, although I can tell you there was a lot of material left on the cutting room floor. 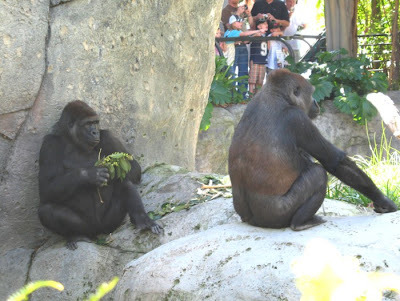 We spent a wonderful day at the San Diego Zoo and left many areas unvisited. I know most people think of zoos as an outing to be taken with children but I’m up for a visit to a zoo anywhere at any time. Perhaps I would have been a animal behaviour scientist in another life, for I surely have the interest. If you ever go to San Diego make sure you visit this incredible zoo, with or without children. I thought it was something flamingoes ate that gave them their colour. Thank you for confirming it! I love orangutans and gorillas. And pandas and koalas! That is interesting about the koala not drinking. The “cutting room floor” – you are scaring me, getting so professional, jmb! I’m going to be really daft now and say “cute little koala” and I never saw a camel like that! Sounds like the ticket price was very good value. We went to the Wild Animal Park and didn’t get to the zoo, but I will definitely go next time I’m in the area. Did you get to see Sea World? The camel evolved in North america, so in a sense, it’s come home. 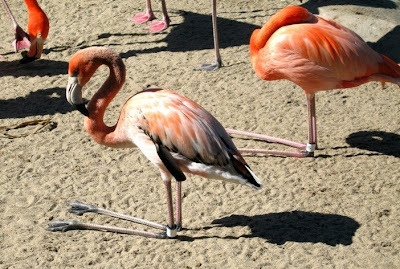 Excellent photos Jmb – the one with the flamingos using their knee joint was something I never knew and quite fascinating to see. Their colors are beautifully vivid. Thanks for this great tour! Interesting post and good point about visiting the zoo with or without children. I particularly like zoos which are into conservation and try to have habitats as natural as possible. City zoos I visited as a teenager depressed me and I’ve been glad to see some of the trends over the past few decades towards a different kind of zoo than I remember as a younger person. I haven’t been to the San Diego Zoo but given the opportunity I would like to visit it, based on this post. The NC zoo is also geared around conservation and natural habitats and is only a little over two hours from me. I think I’ll suggest to Bill that we go sometime since our past trips were with our daughter when she was fairly young and that’s a totally different kind of zoo experience than going when you don’t have to keep a little one out of trouble. The NC one currently has 500 acres in use with another 900 acres for future development so it’s quite large. You’ve inspired me to go back, especially since they’ve added quite a bit since I’ve been there last. Now that was a wonderful walk down memory lane. I know that zoo well and never tire of it. One place I have always wanted to see was the San Diego Zoo. My family went to the Zoo in Mexico City, and it apparently is very good as well. I love the picture of the panda. What a life! I loved this place when Q and I went there years ago. It is the only zoo that did not make me sad. I had NO idea that flamingos could do that! And I’ll definately check out that zoo if I ever make to San Diego. 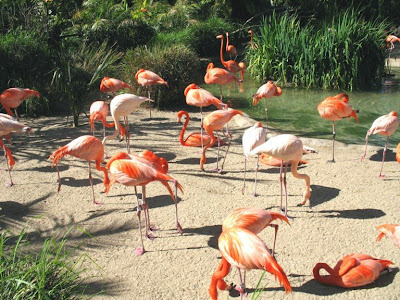 In the wild it is usually shrimp which give the flamingos their colour. Some great animals at this zoo. Just an expression, you know. I could not resist it. Expensive but worth it. I’ve been to the Wild Animal Park on another occasion as well as Sea World and the Zoo twice before too. As is often the case I learn something from you. I wish I had your fabulous memory. Glad you enjoyed the photos, the flamingoes were so stunning and interesting to watch. You should visit the NC zoo, it sounds excellent too. If I were close to one I would become a member as my daughter is of the Bronx Zoo which is now excellent too. Zoos have changed a lot over the years. This was my third time there and I never tire of it either. I’m sure you would enjoy the SD zoo as well. They have four pandas but this was the only one on display that day. A trip down memory lane for you too. Zoos have changed such a lot and they are doing great things to preserve some animals which are endangered. I could not resist adding that photo. It makes me shudder to look at them doing that. Lucky you, I would so love to go there. I love flamingoes. Oh I love the elephants and flamingos! I wish we had a great zoo like that around here. Fabulous! As zoos go, San Diego is about the best after the London Zoological Gardens. Thanks for the visit. I think it was San Diego Zoo where the keepers used to entice the elephants back into their enclosure at night by leaving hay there as a treat. After a short time, the elephants found they could extend their freedom, as it were, by taking it in turns to go in and eat some of the treat. Aside from anything else, this would require each elephant to trust the others not to gobble up the lot. And of course they would have had to communicate how to do it. Both of which would be far in excess of what domestic dogs could do.